Will your “TEAM” be there? 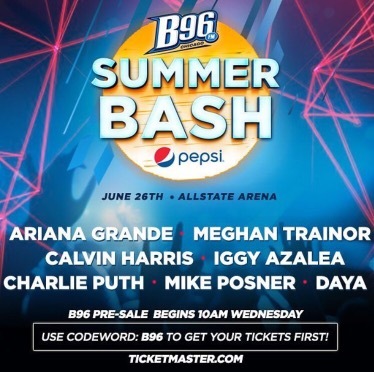 Chicago radio station, B96, announced their annual B96 Pepsi Summer Bashlineup, and as always, it’s a BIG one. Ariana Grande, Iggy Azalea, Calvin Harris and more will hit the Allstate Arena on June 26th. You can get your tickets before the general public beginning this upcoming week. The B96 Pre-Sale goes on sale this Wednesday at 10am on Ticketmaster. Use codeword “B96“. Tickets for the general public go on-sale Saturday, April 2nd at 10am.